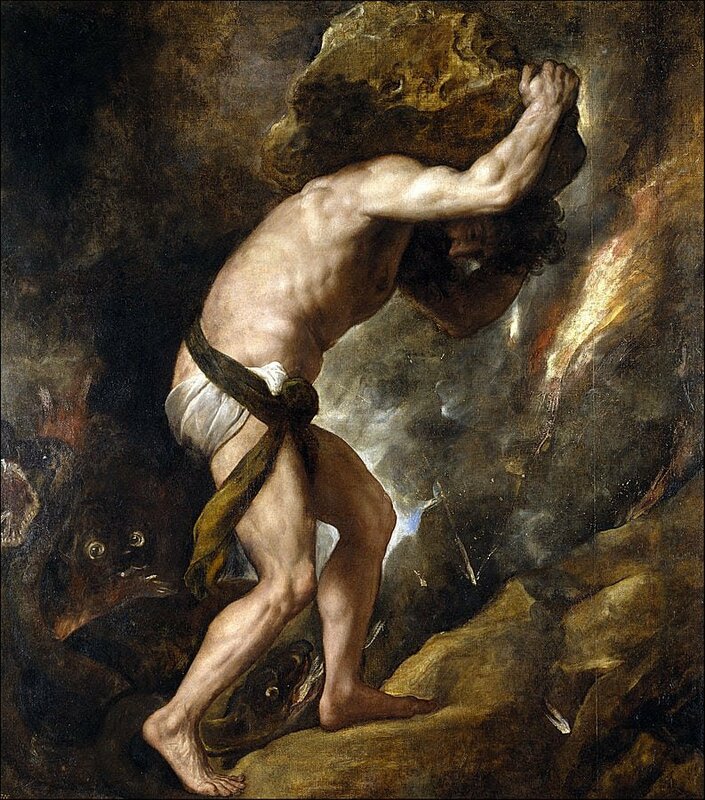 In the Myth of Sisyphus Camus acknowledges ‘the feeling that true knowledge is impossible’. The Absurd – as it is understood philosophically – is elusive and hard to pin down. The first component of the Absurd is understood in that feeling when you, for a brief moment, realise the bizarreness of the rituals people do, or the strangeness of an ‘ordinary’ pebble or look up from your everyday habits and realise the pointlessness of routines which keep us clocking forwards towards our death. We become desensitised to the world, but in brief moments of lucidity can get a glimpse of its unfathomable, alien nature. Pause for a moment to distance yourself from the layers of experience and mythology which normalise everyday experience. Say the word absurd a few times and recognise its alien nature. We understand the Absurd in realising the strangeness of the universe we inhabit and, secondly, its disparity with our demands of it, for truth, clarity, certainty and purpose. It is deeply tied to ‘existential dread’, and a realisation of the hopelessness of Man’s situation. Attempt the impossible, achieve the Absurd. Man is driven to ‘true’ knowledge and to truth as inevitably as a moth seeks the flame. Only when its true scouring nature is revealed do most recoil. When man attempts the impossible, to have ‘true knowledge’, he achieves ‘the Absurd’. This knowledge remains as a distant light – maybe unreachable – providing enough light in the gloom for the Absurd to be seen. There is a temptation to turn back. Earlier there have been several splits in the tunnel, an opportunity to change course. At each turn the light seemed to be closer and the path easier say those already walking down it. Once walking down that path, they claim that the light is clear to see. Yet at the turning point, and peering into the dark, no light can be seen. Are they unaware of their stumbling or am I unaware of the light? Yet the Absurd is not despair. There is something to rejoice about despite the harsh rocks underfoot and the elusive light dancing ever further out of reach. Dance on the stones down the tunnel and laugh, dying abandoned and broken, still no closer to that elusive goal yet with a smile and gritty determination. The weeping bodies of those who have come before you crunch underfoot and that peace they have will not be denied to you. This wretched world! This deluded dream – attempt the Absurd, achieve the impossible – is my rock. Blessed Sisyphus! The fading light glints in misty eyes. A body slumps against a rock, then clatters onto the floor; silence reigns.